Fahadh Faasil smiles into the mirror; his jawline is clean-shaven but he has a thick, bushy moustache. His admiration for himself knows no bounds. “Raymond, a complete man,” he mutters to himself. Shammi (Fahadh) is a man. A man’s man. This beautiful introduction that distills a character’s essence so succinctly underscores the mastery with which director Madhu C Narayanan handles Kumbalangi nights. Shammi though isn’t the hero of the film; Kumbalangi Nights is the story of brothers Saji (Soubin Shahir), Bobby (Shane Nigam), Bony (Sreenath Bhasi) and Frankie (Mathew Thomas). It is the story of outcasts who find their worth and place in life through love. Football-crazy Frankie (Mathew Thomas) is ashamed to invite his school friends to his home, set on a fishing hamlet, where his brothers Soubin and Shane are constantly at odds with each other. Mathew considers his home to be in squalor, calling it the worst house in the Panchayat. The hamlet is used as a dumping ground for stray dogs and cats, serving as a metaphor for their place in society. Saji (Soubin) and Bobby (Shane Nigam) are both loafers, who live in their own worlds and are unwilling to earn an honest penny. Bobby (Shane Nigam) is a happy-go-lucky man who loves his music (his portable speaker travels with him). His opening frames show him playing ‘Happy’ on his portable speaker as he serves himself rice and fish, their staple food. Shane is averse to working and his friend advises Babymol, who needs Shane to engage tourists at her homestay, that the proposition must be put forward as a favour as opposed to ‘work’. Anna Ben, the find of the movie, is delightful as Babymol, a strong-willed woman who looks to chart her own course in both love and life. The blossoming love affair between Babymol and Bobby warms your heart. 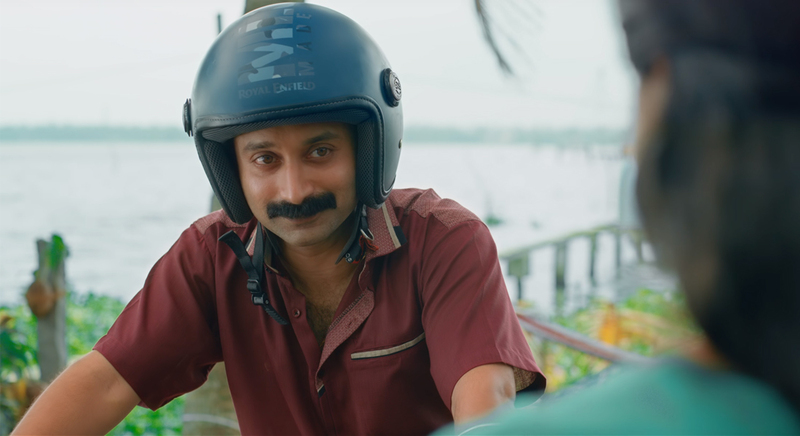 Sushin Shyam’s score complements the movie brilliantly, especially the bits centered around Fahadh’s character and when Soubin is torn with grief. His soundtrack doesn’t call attention to itself and provides a perfect landscape for the movie. ‘Cherathukal’ in particular, grows on you with time. The obstacle to Babymol and Bobby’s love life comes in the form of Shammi (Fahadh Faasil), her brother-in-law who stays with her family. Fahadh’s unique take on Shammi guilts us into laughing at his toxic masculinity while also making us conscious of the uneasiness in every scene he pervades. One fine example is a kitchen scene where Fahadh hangs by the door and questions his wife, played by Grace Anthony, and Babymol on what they were talking about. Despite repeatedly being told it was something personal, Fahadh continues to question them, all with a smile on his face. When Soubin approaches Shammi, who has established himself as the patriarch, to discuss Babymol’s marriage to Bobby, Fahadh reminds Soubin of his family’s place in the lower strata of society and that Bobby does not have a job or a house. One poignant moment is when Soubin cries his heart out to a psychologist following a personal tragedy. It is the women in Kumbalangi Nights that offer hope and purpose to the lives of these men. Bobby (Shane) in particular is constantly found questioning his worth, but it is Babymol’s persistent love that serves as his anchor in what could have otherwise been a turbulent life. Shyam Pushkaran’s script, excellent dialogues, and narration are central as it has been in the recent past with movies he has been involved with. Providing context by imbibing local culture and dialects into his scripts has added a new dimension to his storytelling. The production design and vibrant neon-themed visuals, shot by Shyju Khalid and edited by Saiju Sreedharan, lend a warm familiar feeling to Kumbalangi and its characters. In an intense climax scene, Fahadh chides Babymol for her progressive thoughts and blames cinema for influencing the mindset that challenges patriarchy. Kumbalangi Nights is exactly that kind of movie; a movie that challenges status quo, opens minds, and erases lines on the sand.